Berlin's rental restrictions have returned nearly 8,000 apartments to the residential market, officials say. Housing costs had spiked in Germany's capital as speculators and Airbnb entrepreneurs sat on usable residences. Almost 8,000 apartments were returned to the rental market in Berlin last year thanks to strict property laws introduced in 2016, according to figures from the Senate Department for Urban Development and Housing published by German media on Sunday. About half of those had been used as vacation rentals through services such as Airbnb, which have long been criticized for their effect on housing markets worldwide. The remaining 3,915 apartments returned to the long-term residential market had simply sat empty. The areas most affected by the vacation rental laws were the inner city districts of Friedrichshain-Kreuzberg (1,186 former vacation flats), Tempelhof-Schöneberg (763) and Mitte (642), followed by Pankow (407), Charlottenburg-Wilmersdorf (357) and Neukölln (184), according to public broadcaster RBB , which first published the figures. The law, the Zweckentfremdungsverbotsgesetz, introduced fines of up to €100,000 ($125,000) for landlords illegally renting out their property for short-term stays. Since the law came into force, more than €2.6 million euros of fines have been imposed, according to RBB. The ruling Social Democrats (SPD) enacted the law during the previous senate, in which they presided over a grand coalition with their primary rivals, the Christian Democrats. The current center-to-left administration of the SPD, Left and Greens has been working to craft legislation that would allow people to rent their apartments to vacationers for up to 60 days a year without special permission. Should that come into effect, the senate would reportedly seek to increase restrictions on empty apartments. Despite the current law's benefit to renters, the laissez-faire Free Democrats criticized Monday's report, calling any restrictions on the housing market a "farce" and demanding that the measure be done away with completely. RBB reports that there are about 400 apartments that are still permitted to be used as vacation rentals in Berlin. Whether the law is constitutional will be a matter for Germany's top court to decide. The higher administrative court of Berlin-Brandenburg referred the case to the constitutional tribunal last year, but no date has been set for arguments to begin. Airbnb also faces official resistance in such European destinations as Amsterdam, Paris and Barcelona. 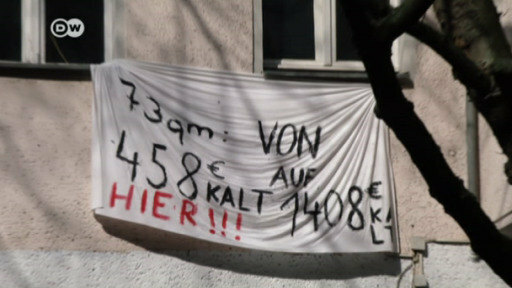 After years of rapidly rising rents, exasperated Berliners are beginning to fight back. They have started collecting signatures for a referendum on expropriating the apartments of the big players in one of Germany's hottest real estate markets. Finding an apartment in a German city is hard work these days. That is especially true for those who have little money. Some critics say it's a dangerous development that could have dramatic political consequences. From occupying buildings in Berlin to street protests in Munich, housing shortages and high rents are driving people in Germany to take action. Now politicians have gathered in the capital for a so-called housing summit.